Teeth whitening toothpaste – What is meant by teeth whitening toothpaste? Traditionally the toothpaste will contain coarse abrasives that scrub the tooth surface to remove stains that discolor the teeth. 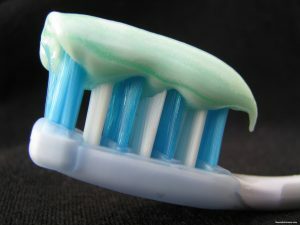 Anti-decay toothpaste – Fluoride compounds are found in most toothpastes with anti-decay labels. Fluoride helps to restore the enamel of a tooth, reducing its vulnerabilities to bacteria, plaque, and cavities. Anti-plaque toothpaste – Individuals seeking to fight gum disease often turn to anti-plaque toothpaste as it does help to inhibit plaque accumulation. Anti-plaque toothpaste contain Zinc, Triclosan, and other ingredients designed to reduce the effects of bacteria on the teeth and gums. Colgate Total – There is a reason Colgate has remained one of the top toothpaste brands, it works! Colgate Total includes fluoride and triclosan to fight plaque and bacteria. Crest Cavity Protection – Crest and Colgate tend to stay together as the leaders of the pack when it comes to toothpaste. Crest’s Cavity Protection toothpaste is designed to fight off bacteria that causes tooth decay. Arm and Hammer Complete Care – This toothpaste contains fluoride and other ingredients to prevent plaque, but it also contains baking soda, which helps to prevent bacteria from growing. Tom’s of Main Natural Care Fluoride Toothpaste – If you want a natural toothpaste, this is the one to use! Tom’s of Main contains fluoride to strengthen the enamel of the teeth, but it doesn’t contain many of the chemicals found in other name-brands. Nature’s Gate Cool Mint Gel – This all-natural toothpaste leaves a brusher with a minty-fresh mouth. It works well to destroy bacteria causing bad breath, but there isn’t enough about this new brand to consider long-term results against plaque. To learn more about toothpaste options designed to meet your oral health needs, call our dental office to schedule an appointment.